Halloween is the perfect time to have fun, dress up, and not notice anything odd about the fangs in a hot stranger's mouth. And honestly? Diana is here for all of that. Unsatisfied with her social, romantic, and academic life, she figures she can at least solve the first two at the party she's been invited to. Instead, she ends up breaking her heels, making bad puns, taking cute photos, playing matchmaker, and fighting for attention from the obligatory party cat throughout the night before everything goes horribly, horribly wrong. Because, well. Something has to give besides the heels. 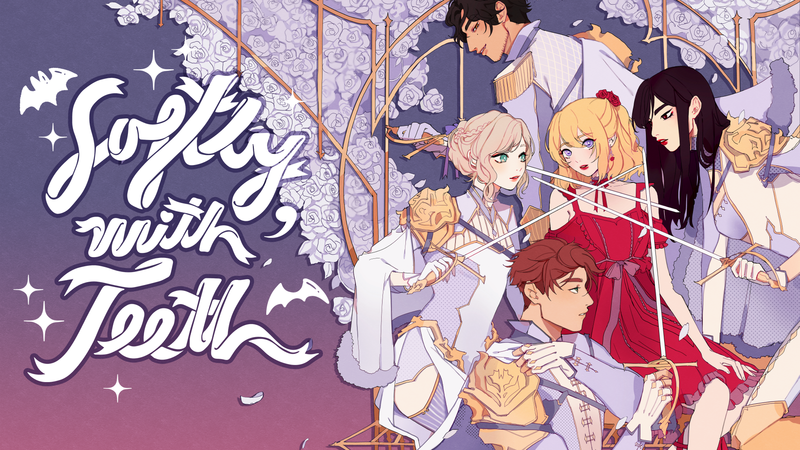 Softly, With Teeth as a whole is a coming-of-age romance visual novel that combines vampires with Faustian lore and an urban fantasy aesthetic, and explores the aftermath of someone's life once even the most significant of changes settle into routine. People always desire more than what they have, after all, but what lengths will they go to to achieve it? Since it's a demo, all assets including art, music, and choreography may change at a later time. If fast forwarding through Madison's intro, her and Diana may "ghost" for a moment. This fixes itself shortly after. The preset resolutions work fine, but resizing the window creates black borders. Currently, the selected options in the Settings screen aren't highlighted properly. The options are selected and do what's expected of them when clicked, they just aren't shown visually as selected. We had to put the bonuses in a google doc for now. Diana has a slight graphical error. This game is about vampires. Demo includes drinking, innuendo, blood and violence (vampire bite), discussion of non-consent relating to vampire bite, occasional situations where protagonist is distinctly and rightfully uncomfortable, but also a consensual bite too.